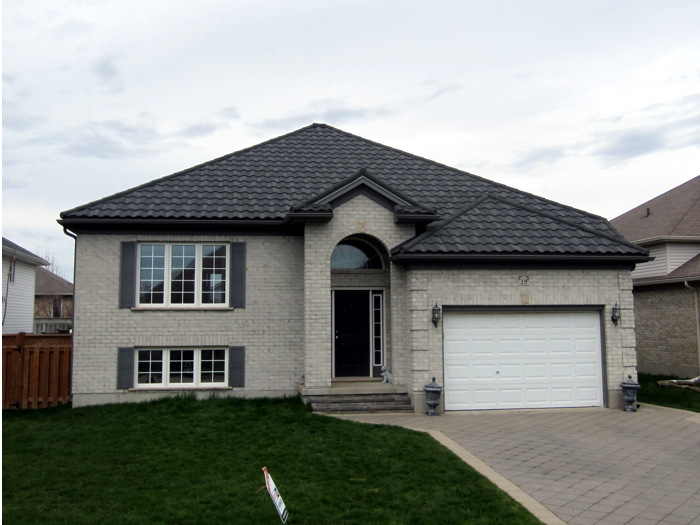 The lovely fieldstone of this Ontario home is complemented by a scalloped Katola Metal Tile in the colour Charcoal by Metal Roof Outlet. 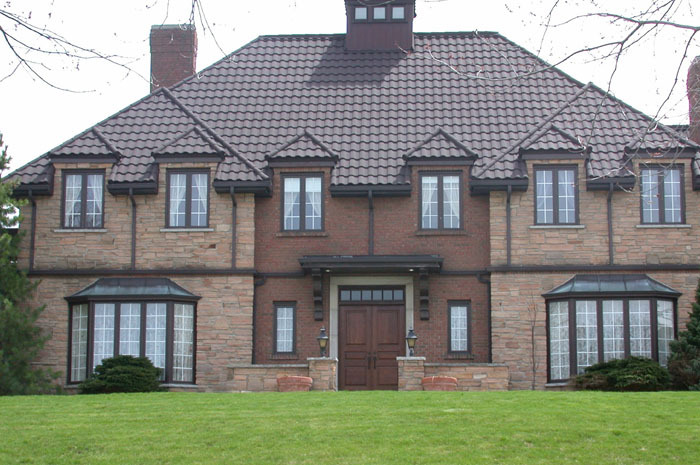 This grand home features a dark Weathered Wood Steel Continental Tile by Metal Roof Outlet in Ontario, Canada. 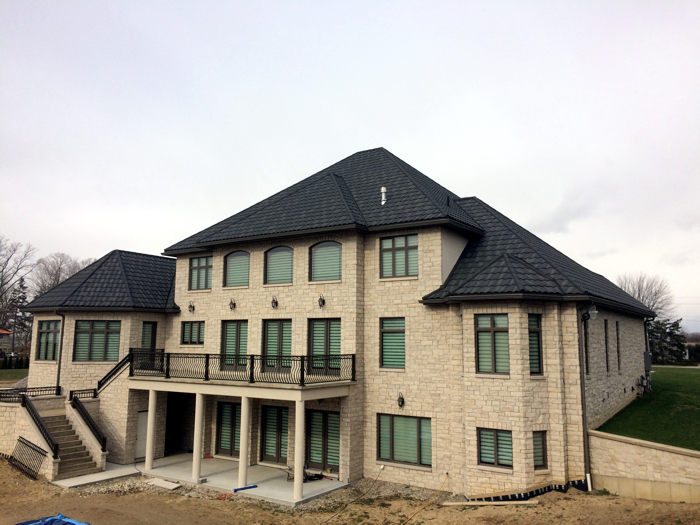 This Ontario home may be a work in progress but the efficient and hard-working installation team at Metal Roof Outlet has already finished the Steel Continental Tile roof! 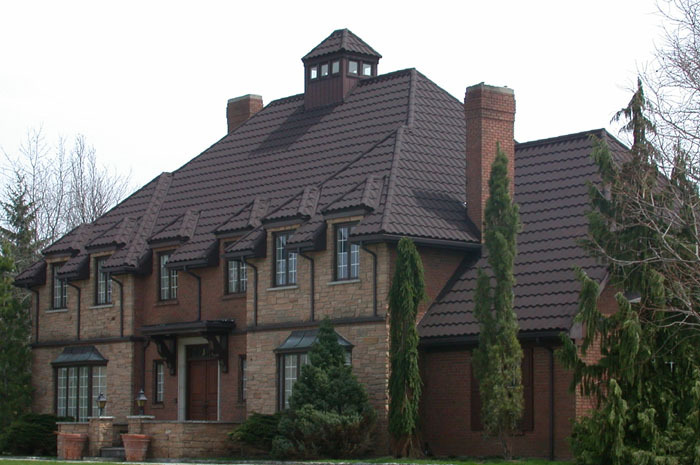 This stately Ontario home’s unique roof is complemented by Steel Continental Tile in Natural Slate style, expertly installed by Metal Roof Outlet. 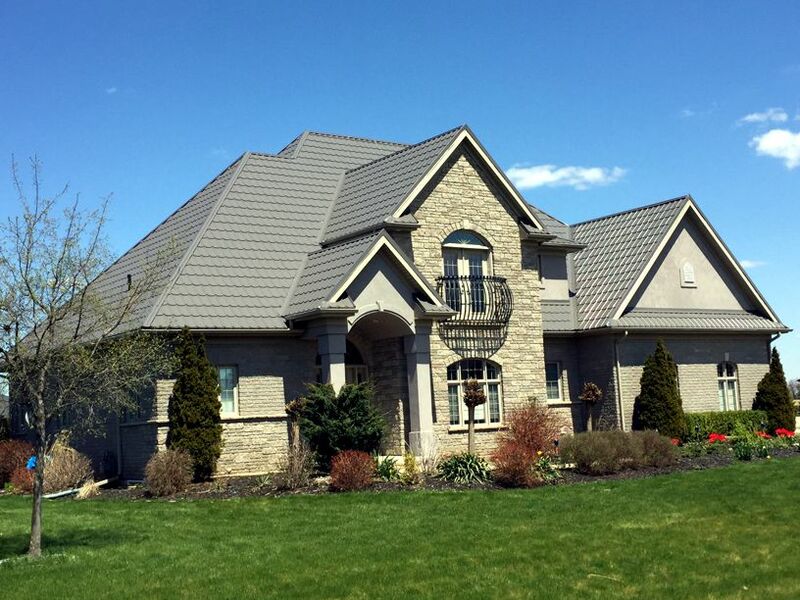 This sprawling, villa-inspired Ontario home wouldn’t be complete without Metal Roof Outlet’s steel continental tile in a classic Natural Slate style. 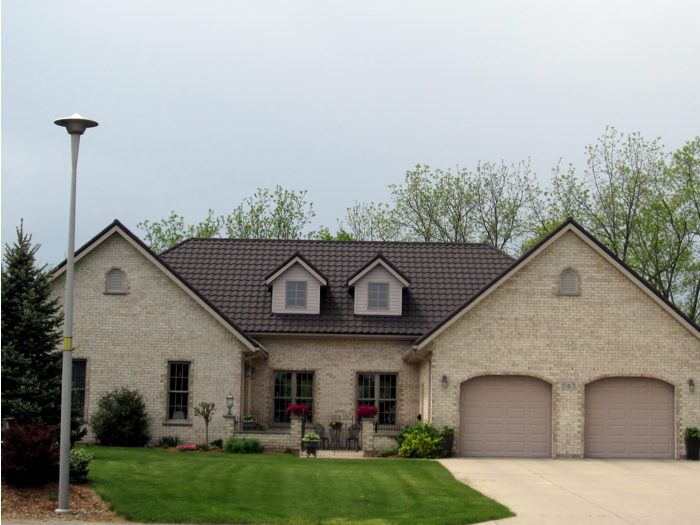 This Ontario homeowner opted for a classic and subtle taupe brick offset by a rich and dark steel continental tile crafted by Metal Roof Outlet. 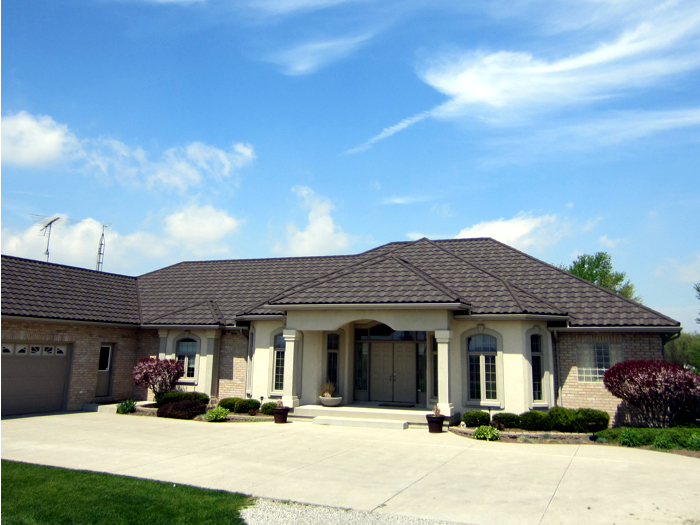 This Ontario home features Metal Roof Outlet’s Steel Continental Tile in Weathered Wood style. This sprawling one-story bungalow in Ontario is anchored by a dark Natural Wood-style steel tile roof by Metal Roof Outlet. 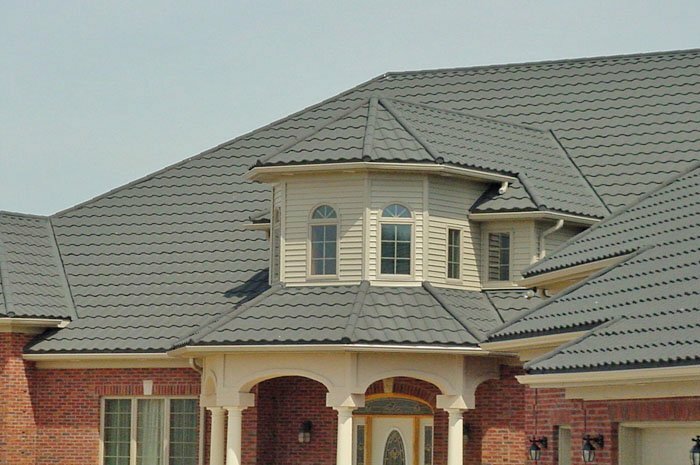 An old fashioned home doesn’t need to be out of date – this steel tile from Metal Roof Outlet combines a classic look with modern materials and technology. 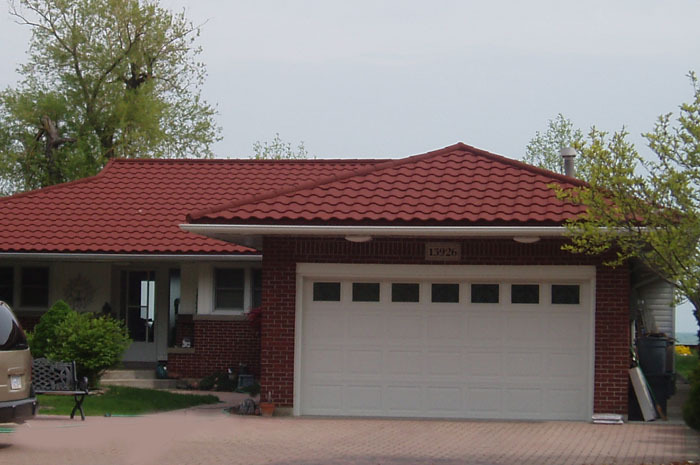 The cream brick in this home pairs beautifully with a terra cotta style steel tile from Metal Roof Outlet, Ontario. 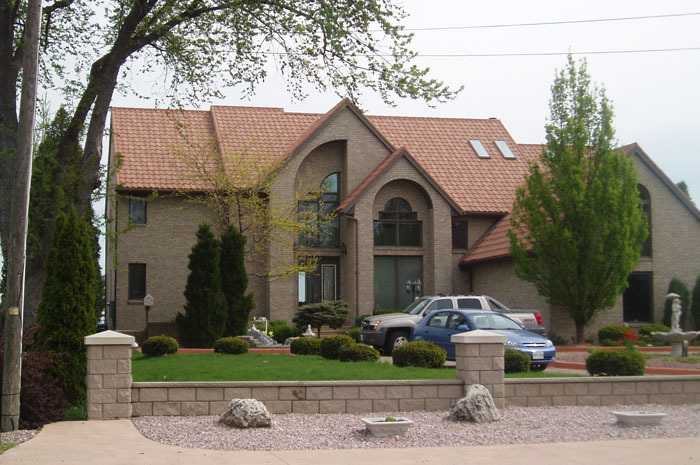 Tile roofs can be costly to maintain and may not provide the function or durability you need. 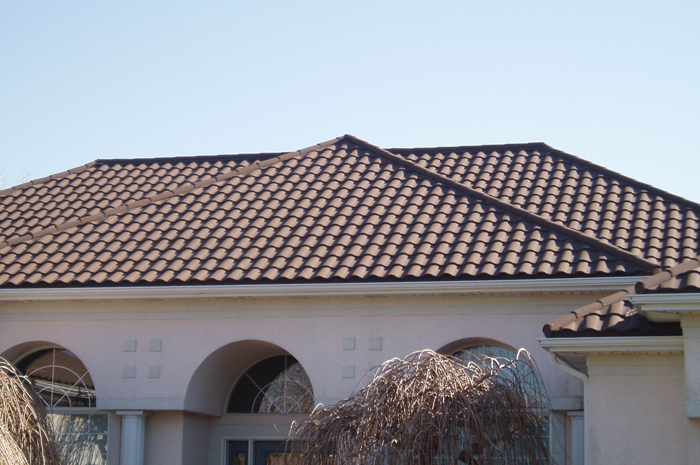 Metal Roof Outlet can offer you a tile look with all of the features of a strong metal roof. 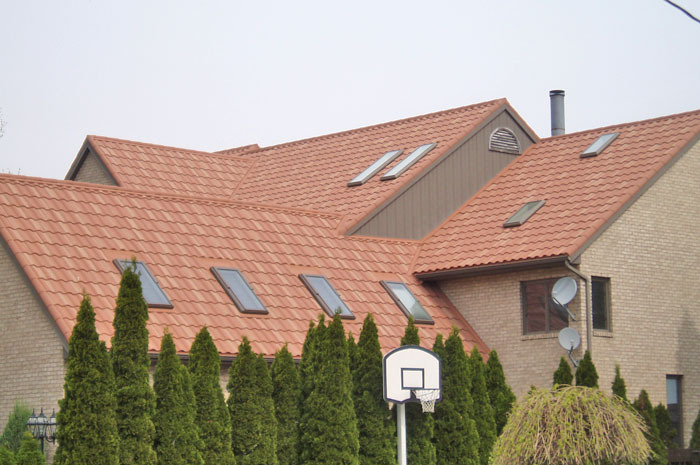 This Ontario home has a plethora of skylights – no problem for Metal Roof Outlet’s professional and capable installation teams. 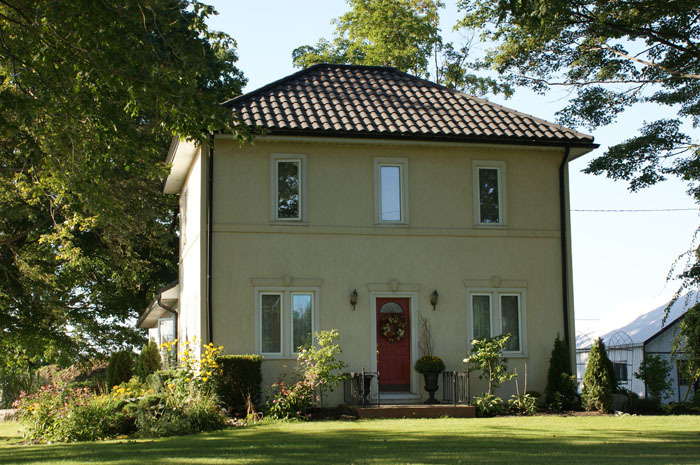 If you have a tall vaulted roof space like this Ontario home, you want to make the most of it. Metal Roof Outlet’s versatile and beautiful steel tile will look incredible without sacrificing strength and longevity. 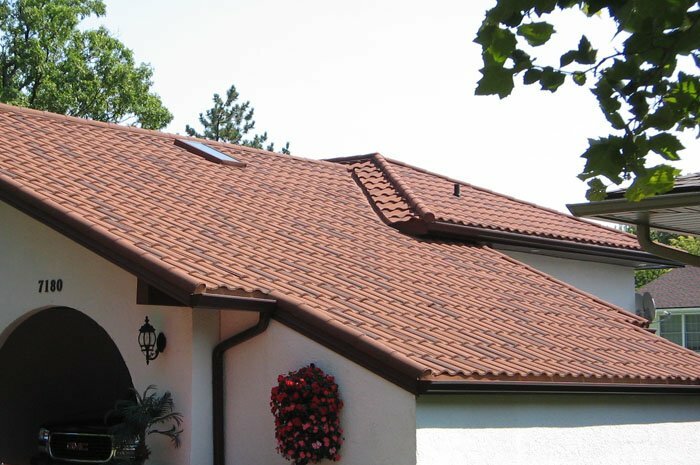 Terra Cotta tiles are common in warmer climates – for Ontario, you need a tile-look steel roof from Metal Roof Outlet to last through all Canadian seasons. 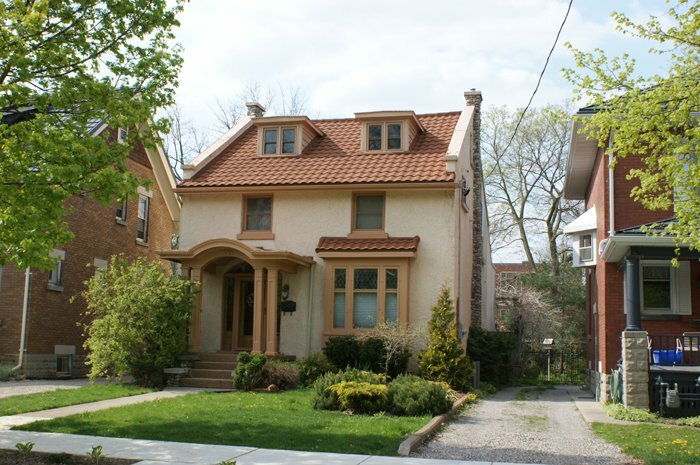 These Ontario homeowners are fond of red – so they topped their red-brick home with a complementary rust-coloured steel tile roof from Metal Roof Outlet. 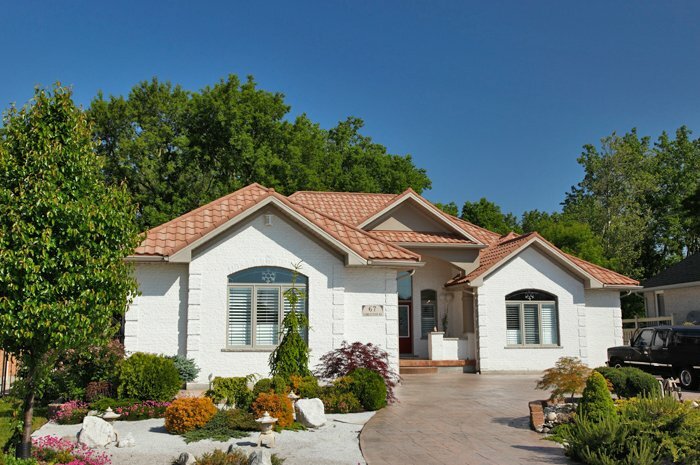 Many people who opt for tiled roofs are seeking a mediterranean look – but the traditional materials aren’t suited for Canadian winters. 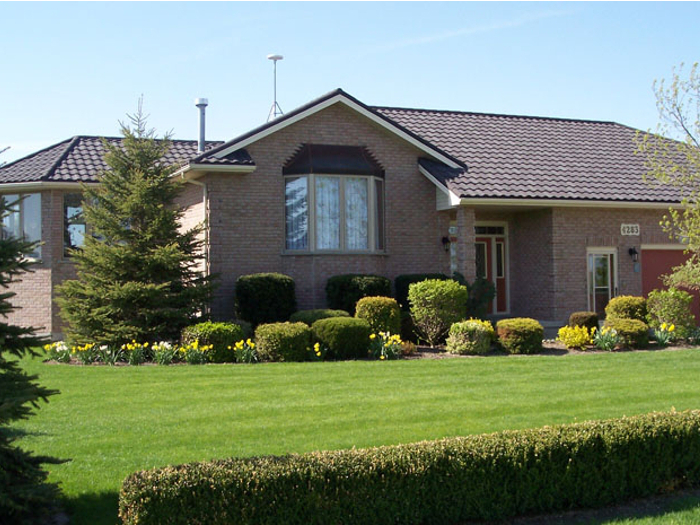 Metal Roof Outlet can provide you this beautiful classic look with all of the strength of steel – for those frosty Ontario days. 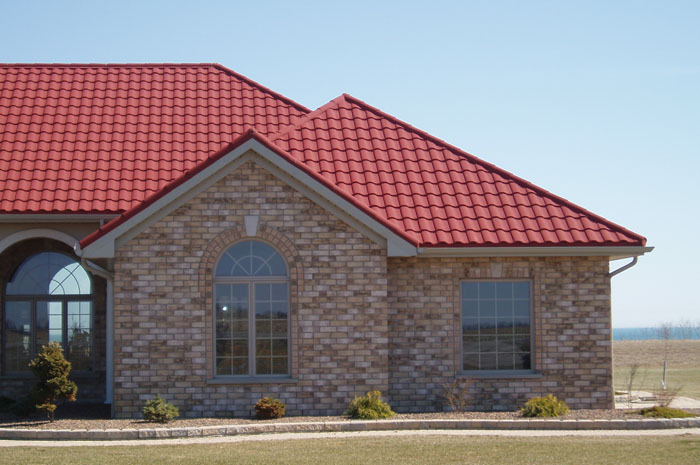 Brighten up a beige home with a red steel tile roof from Metal Roof Outlet, Ontario. 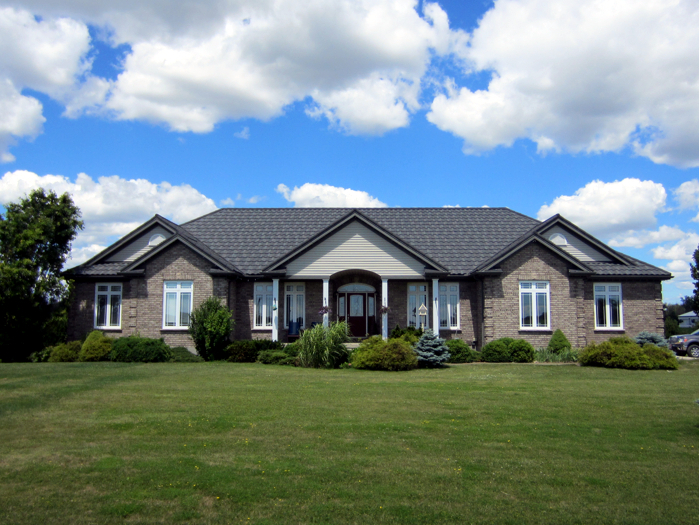 This sweet home in Ontario is topped with a steel tile from Metal Roof Outlet. 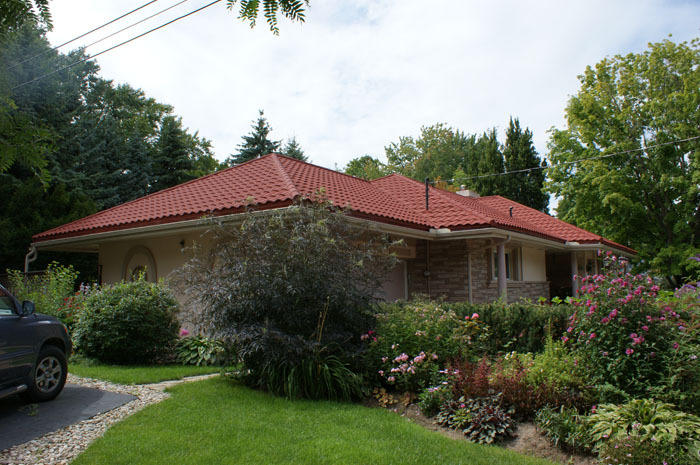 The high peaks of this Ontario home are complemented by a terra cotta-look metal roof from Metal Roof Outlet. 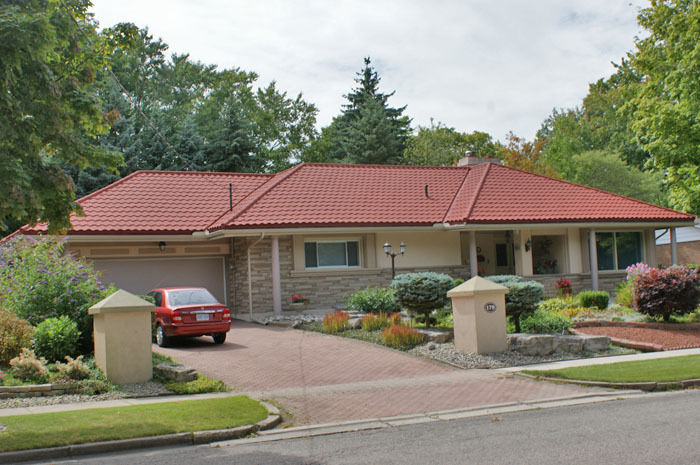 One story bungalows can be spiced up with a tile-look steel roof from Metal Roof Outlet, Ontario. 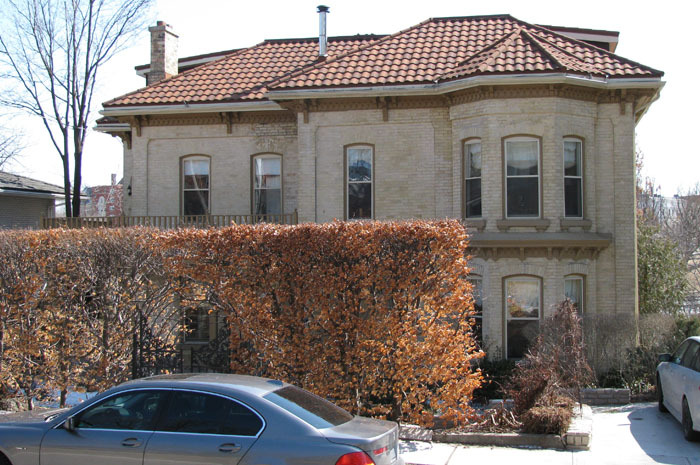 This grand historical home in Ontario needed a classic looking roof with excellent durability – so the owners chose Metal Roof Outlet’s steel tile. 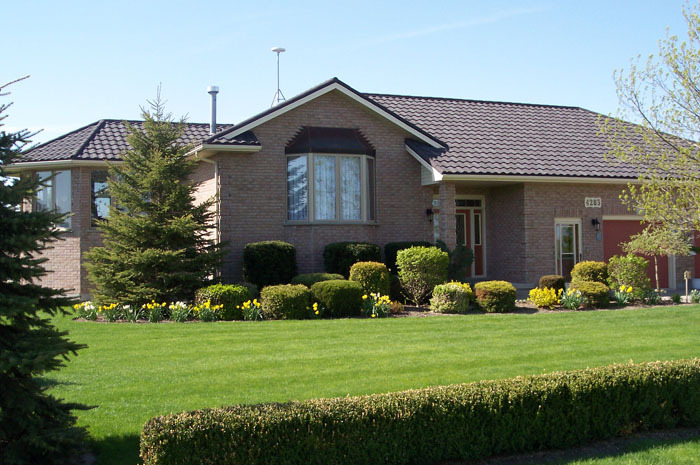 The variances in the brick colours of this Ontario home are anchored by a bright steel tile roof by Metal Roof Outlet. 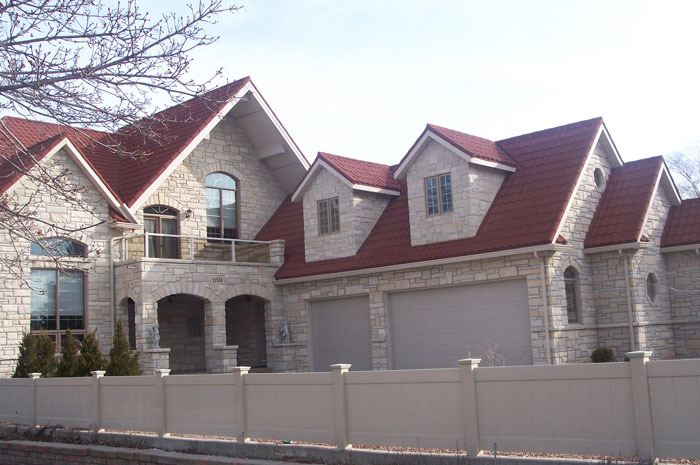 We love the look of stucco walls and a terra cotta, but to make it through all four Canadian seasons you need a tile-style metal roof from Metal Roof Outlet. The mellow stone of this Ontario home gets a pop of colour from Metal Roof Outlet’s steel tile. This Ontario family chose a softer, peachy colour of steel tile that wouldn’t overpower their bright white brick. 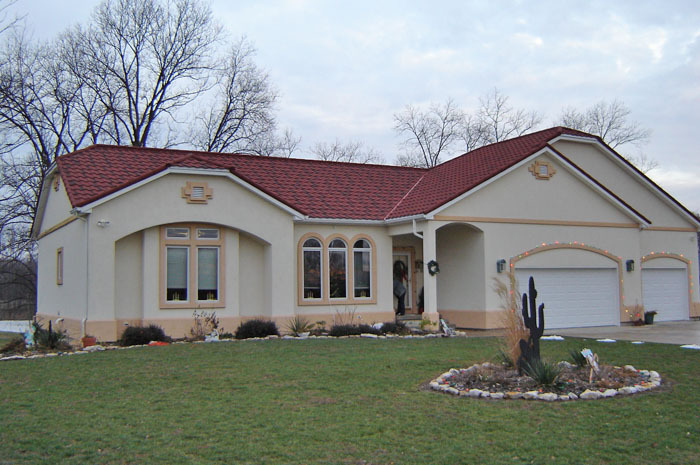 We love the tall arch on this Ontario home, and Metal Roof Outlet’s capable installation team had no problem covering it with gorgeous steel tile. 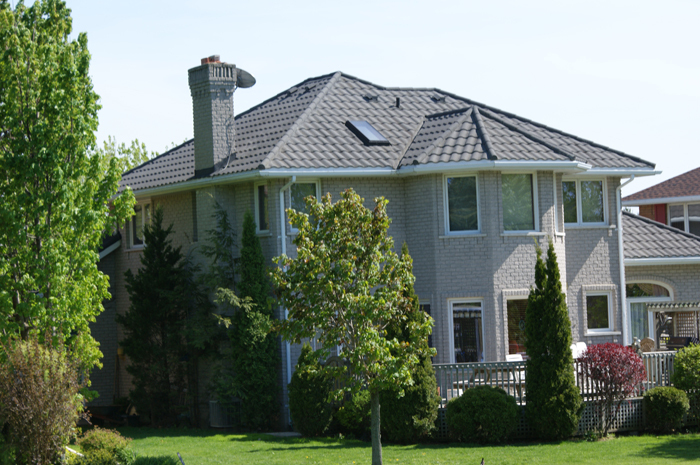 This Ontario home features a steel tile roof installed by Metal Roof Outlet. 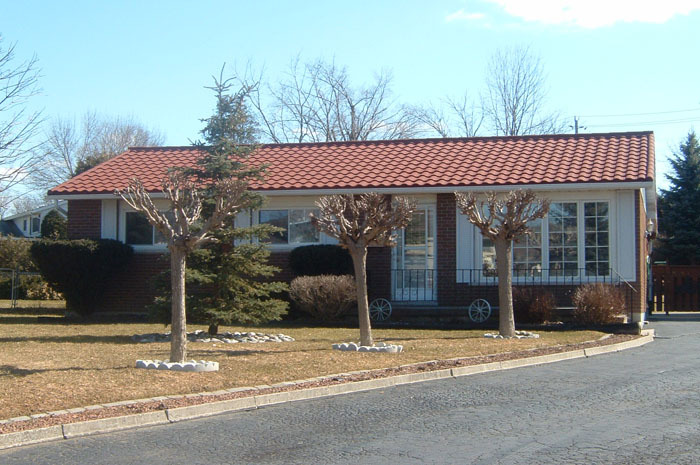 Turrets can be difficult to roof – unless you’re Metal Roof Outlet’s excellent installation team. 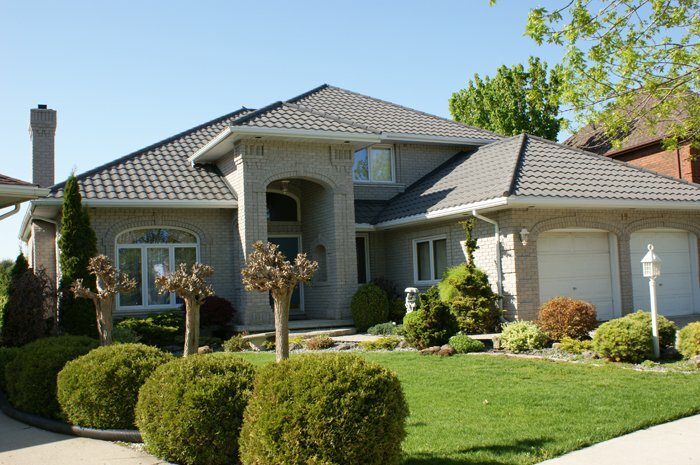 This Ontario home features a steel tile roof from Metal Roof Outlet.